The New York Times ran an article on selling books in unusual places — unusual for book publishers, that is. For most of us, it seems natural to find a gift book in a gift store, a book on “how to make it in the music industry” in a music store. In my experience, book publishers have traditionally been much less than aggressive in pursuing “special sales,” “special markets,” or sales to what they call “nontraditional book outlets” because publishers offer a low discount on books to retailers and figure it’s not worth the effort to talk stores into carrying books. However, if the match between the book and the store–or catalogue, for that matter–is perfect, the sales can be phenomenal. This is especially true when the store is a chain. I saw this when I was in-house at HarperCollins and one of my books, Get Your Act Together! by Pam Young and Peggy Jones, was picked up by a major office supply retailer, which ordered 20,000 books. Note that these special markets sales, as they’re called, are unlike traditional bookstore sales in that the store can’t return the books so that’s a solid sale for the author. Cinematherapy took off in a major way because it was picked up by many gift stores and catalogues such as Seasons. I’ll never forget how shocked I was to wander in to a Providence, Rhode Island, bookstore one day when I was on vacation, see a display of my book, and find out that that store alone had sold 100 copies of Cinematherapy! Another book I worked on, The Diet Cure by Julia Ross, is carried in just about every health food store in America–due in no small part to the fact that The Diet Cure recommends the purchase of nutritional supplements that these stores carry as well. As the traditional bookstores struggle to redefine themselves, I think book publishers will take a second look at “nontraditional book outlets” and “special markets” rather than treat such sales as an afterthought, as they did for too long. About five years ago, one of my authors could not get his publisher to make sales into catalogues that already had accounts with his publisher, and was told again and again by the catalogue owners, “I’ve called your publisher and begged for a copy of your book because it’s perfect for us, but no one ever sends one.” To me, it was a sure sign that publishers have been too lax about pursuing book sales through non-book stores! Bookstore sales for Cinematherapy were great but gift store sales of books were even better! 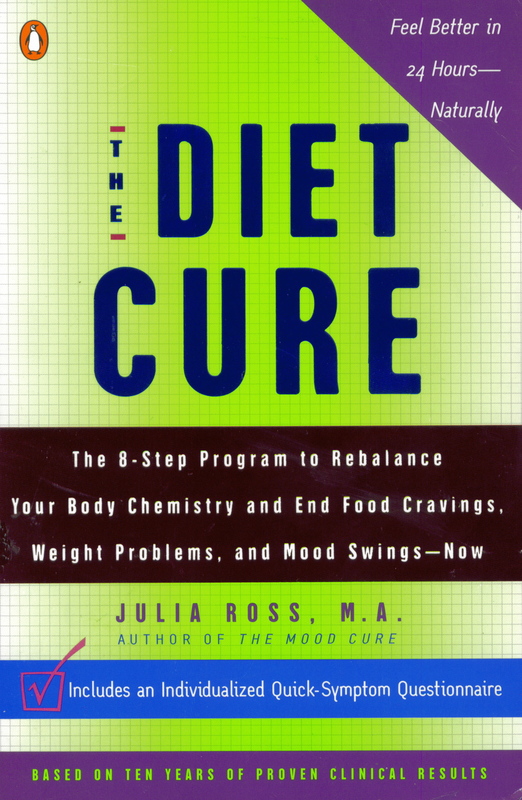 The Diet Cure by Julia Ross did well in special markets. It can be purchased in almost any health food store.